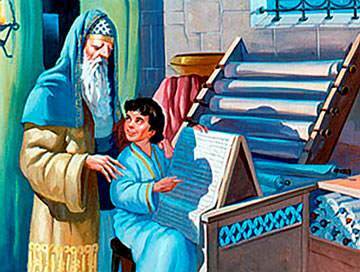 Do you remember the story of Samuel, the boy who was brought up in the Temple to be one of the helpers? Now we are going to hear a story about another little boy who lived in the Temple. His name was Joash, and he was a king’s son. Joash was only a tiny baby when he had been taken by his nurse to live with the priest of the Temple, Jehoiada. 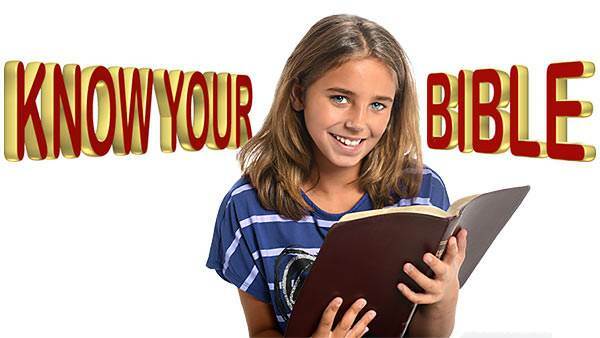 As soon as he was old enough the priest taught him to read and write, and talked to him every day about God’s laws. Then Jehoiada would sadly say, "The people do not care about God’s House now. No one will help to mend the broken walls and pillars." On the day that Joash was seven there was great excitement. 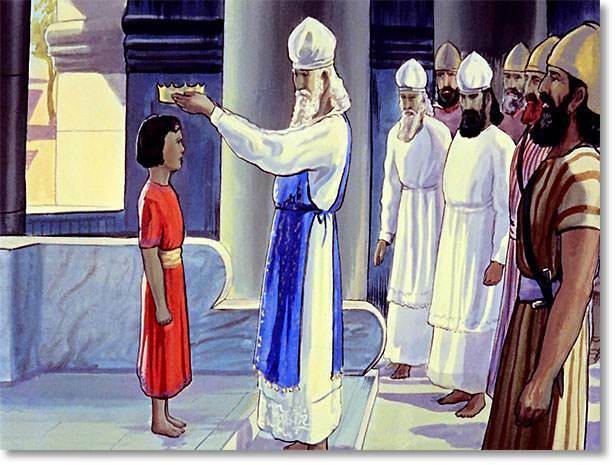 The priest called the people together in the Temple court, and before them all little prince Joash was crowned King of Judah. The trumpeters blew on their silver trumpets, the musicians played on harps and cymbals, and the people sang praises and shouted, "God save the King!" 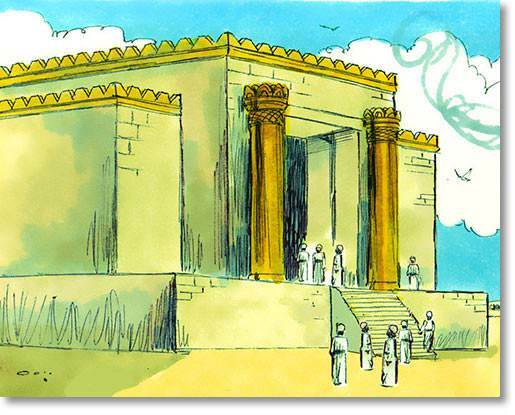 The young King Joash went back to the palace to live, but he never forgot his promise to repair the Temple. Before long he sent for Jehoiada the priest, and said, "Make a wooden chest, with a hole cut in the top, and set it outside the gate of the Temple. Then send a message to all the people to bring money to repair the Temple and make it clean and beautiful." Jehoiada did as the king commanded and soon the people were flocking to the Temple with gifts of money. They brought so much that the chest was quite full at the end of the day. 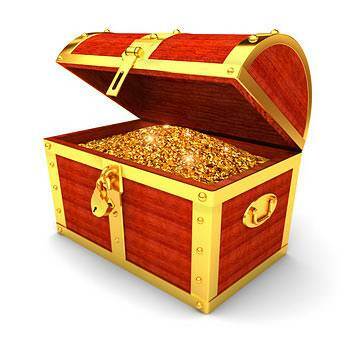 Each evening the king’s officers carried the chest to his palace, emptied it, and took it back to the Temple. Soon there was plenty of money to start repairing God’s House. 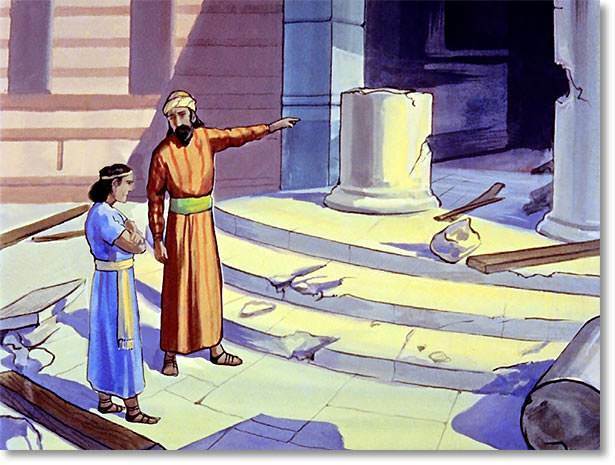 Then King Joash sent for stone-masons to build up the broken archways and pillars, and make the walls strong and firm. Carpenters came to make new doors and tables, and carve beautiful patterns on the woodwork inside the building. Metal workers mended the broken ironwork and brass vessels and candlesticks. Soon the House of God was strong and clean and beautiful again. 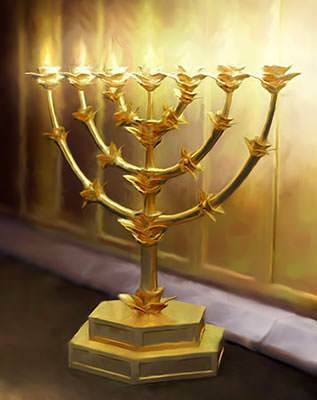 And with the money that was left over, the king had beautiful gold and silver vessels and candlesticks made. Then once more Jehoiada called the people together to the Temple courts. 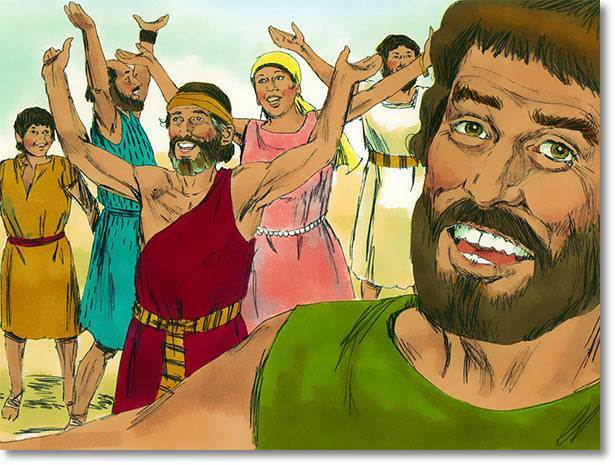 When they saw the strong walls and pillars, the great new doors of polished wood and brass, and the gleaming ornaments of gold and silver, the people shouted for joy. 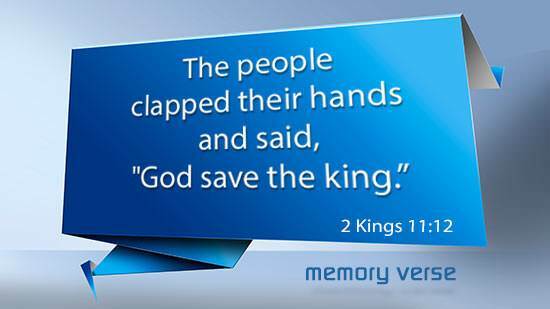 Then the king, the priests, and the people all sang together their praises to God.